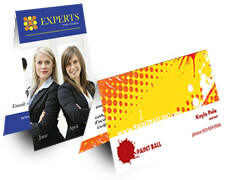 Do you want something more than Business Cards to impress your clients in Kamloops? Then Foldover Business Cards is the way to go. Foldover Business Cards fit more information about your business in Kamloops and at the same time as convenient as regular Business Cards. Foldover cards give you double the space to get your message across. Make your business in Kamloops stand out against the competition with this truly inspirational and cost-effective print product. We all know that a business card is the first impression that someone will have of your business - so why not give them a little more information about what you do or what you offer in Kamloops and area. The fastest turnaround time for our customers in Kamloops is 3 business days. The lowest quantity available for this product is 100 (digital printing process). The finished product comes flat with the score line (not folded). Our customers in Kamloops have a choice to print their cards on our high quality digital or offset presses. Let our experienced designers to create a truly unique and creative design for your foldover business cards. If you would like to get more information about prices, turnaround times and finishing options for this product in Kamloops or you cannot find what you are looking for on this page, please do not hesitate contacting us or requesting a quote and one of our Inspirational Representative Agents will help you with all your printing needs for Kamloops. We are always happy to help you over the phone, via email or in person.